Warning: Before You Begin Trying To Rebuild Trust With Your Spouse or Partner, Think Twice.. If you value your relationship, watch the videos and read this page from beginning to end. We promise you we will show you how to make things better. We're Susie and Otto Collins and we want you to know about a new way we've discovered to build trust and restore your love and connection. To help you get started--Are you struggling with any of these issues? You're probably fearful of when your spouse or partner is going to do something else behind your back that will crush your heart and destroy your love even more. In most cases, the very things you're doing to try to get your needs met in your relationship or marriage are actually the very things working against you in trying to create the close, connected love relationship that you really want. Do you know about the 4 F's? ...and as we explain in this video below, the 4 F's are something almost every single person alive uses to create feelings of safety and security when they're afraid they're going to get hurt (or hurt again). Using any one of the 4 F's WILL NOT help you build trust. Using them will also NOT help you create the love, intimacy and connection you really want with your spouse, partner or lover. In every life and in every relationship or marriage there are these moments that happen that are "make or break" moments. We call these moments "choice points" and we're sure you've had many of these in your life so far. If you haven't, you wouldn't still be alive. Choice points are these moments when you're faced with a decision and your relationship or life could take a completely different turn or path based on the decision you make in the moment. This is the way trust triggers work and why it's so important that you use them to start building more trust and create more love and deeper connection in your relationship. Here (in the video below) is an example of one of these choice points from the early days of our relationship where what we said or did in the moment could have either helped us create a closer and more loving relationship or it could have created BIG TRUST issues between the two of us that we might never have been able to repair had we not known how to trigger trust between us in a very volatile moment. How Easy Will it Be for YOU to Use These Trust Triggers To Build More Trust, Love and Connection In Your Relationship? When you start using these "trust triggers," building (or rebuilding) trust , love and connection with your spouse, partner or lover will be so MUCH easier than you might think. Is what I'm about to say, what I'm about to do, or the way that I'm thinking in this moment going to move me closer to or further from what I want? If you will only answer that question in a truly open and honest way, rebuilding trust that's been lost will be so much easier for you than you ever thought possible. Most people who are trying to heal the distance, disconnection and trust issues in a relationship have got it backwards. Most people think that their spouse, partner or lover should be the one to take the steps towards repairing your relationship and healing your love and as we see it-- *IF* that happens --Great. But, since you're the one reading this and we're assuming that you want more trust love and connection between the two of you, we don't recommend that you "wait them out" and HOPE that they'll come toward you and start wanting to create that closeness and connection. While they may want to heal the problems, challenges and lack of trust between the two of you--YOU may have to go first. Because you're the one reading this web page and you're the one exploring how to create more love, intimacy and connection between the two of you. It doesn't matter who makes the first move toward repairing your relationship and starting the healing that BOTH of you need to create the love and connection you want. It just takes one person to start building more trust, love and connection in your relationship. 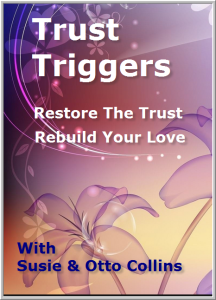 You can use these "trust triggers" that we're going to be teaching you here to almost instantly "trigger" trust being built or rebuilt in your relationship. The trust triggers program we're offering you is an amazing way to make simple changes to your thinking, words and language that instantly trigger the desire within your spouse or partner to feel more connected to you and want to come closer to you in all ways--emotionally and personally. This program you're about to get access to is so simple and so powerful for someone like you who wants to build more trust, more love and a deeper connection. Part 1 is 5 short audios (about 30 minutes each) you can either download to your phone, mp3 player or computer and listen to them anywhere--or listen to them on your computer using your computer's built-in music or mp3 player. In these audios, we give you our complete 7-Step Plan for how to use trust triggers to build more trust love and connection in your relationship. Part 2 is the recordings called "Magic Relationship Words That Build Trust" where we teach you how to avoid words that destroy love and connection and how to find and use ONLY words and phrases that build trust when you talk to your spouse or partner. Part 3 is your downloadable Action Guide where we guide you through the program, giving you questions to answer to help you use these new skills and ideas to start triggering more trust, love and connection between you and your partner beginning today. A Bonus Audio called "The 3-Minute Negative Thought Stopper" with Susie leading you through the technique that's been used successfully by hundreds of people to redirect negative thoughts that can sabotage your relationship and destroy trust. Almost everything most people do when trying to build trust, love and connection with someone else (especially someone close to them) is about trying to GET the other person to change first and open first. This trust triggers program shows you how easy it is to start building trust, love and connection when you start with you and coming from a place of "invitation" and "loving boundaries" instead of guilt, manipulation, ultimatums and fear. When you use these trust triggers when you communicate with him or her, they won't feel attacked, ambushed or like they need to be on the defensive with you in every moment and in every conversation. They won't feel like you're putting a question mark in front of everything they say or do (even when you're creating and enforcing a loving boundary). When you use these trust triggers, you'll create more flow, ease and open the door for truth, authenticity and vulnerability in your conversations. You'll also start to feel like you're BOTH on the same team, want the same love and want the same closeness and connection. Some people, in fact, report that as a result of discovering and using these "trust triggers," they've started having the first real, heartfelt and genuinely heart-opening conversations in their relationship that they sometimes haven't had in the last 5, 10, 15 years or more. THIS trust, love and connection building program isn't for everybody. ...You haven't given up on your relationship, you haven't given up on love and you're truly willing to do what it takes to start building the trust and love that you really want. Some people aren't willing to do what it takes and that's OK. But, you're different--otherwise, you wouldn't be reading these words right now. Because you're here (opening yourself to the possibilities of more trust and love in your relationship) -- we think you're one of the action takers of the world and one of the people who wants something special for yourself and your relationship--otherwise you wouldn't be here on this web page learning more about how to rebuild the trust and your love. You've come too far in your life to ever give up on love. ...a love with closeness, connection, deep loving intimacy and a true partnership between two people who care about one another and support each other no matter what trials and difficulties life throws your way. You want to be able to trust and you're willing to open yourself to the possibilities of love one more time. And that takes courage and a desire for more than you're getting right now. Q. "This won't work for me. My situation's too far gone for this!" A.Like anything else, trust is either built or torn down one moment at a time. Although there aren’t any guarantees that your relationship will survive, what we can guarantee is that if you put these triggers to work, you will have a better chance for love and trust to blossom and grow than if you do nothing. Q. "What if I get blindsided again?" A.Sounds like you’re living in the past and future and not in present moment and you’re worried about something that may never happen. That’s not to say that your worries aren’t justified because of what you’ve gone through–but if you stay stuck in fear nothing will change. These trust triggers can point the way out of fear and into trusting yourself that you’ll know what’s true so you’re never blindsided again. Q. "My partner is the one who broke the trust and violated our sacred vows. Why should I be the one who has to focus on all this trust building? Shouldn't he be the one who needs to be apologizing, making it up to me and being accountable for all the pain he's caused?" A.Yes–while all that is true for you, the fact is that it does take two people to rebuild trust and restore love. Since you’re the one that’s here right now exploring how to build trust, you’ll be the one to take the lead. Remember, without trust no relationship can survive–at least not for very long. We’re guessing that you don’t just want to have a love that survives but rather one that thrives. Using these trust triggers can work miracles in helping you create more love in your life! Q. "I've heard it said that 'once a cheater always a cheater.' Is that really true? How can I learn to open my heart and trust again if there's a possibility my partner could cheat on me again?" A.We don’t agree with that belief–“Once a cheater always a cheater” because we’ve seen lots of evidence to the contrary. You learn to open your heart one moment at a time when you notice evidence that points you in that direction. You do not open your heart and trust in one grand gesture. You open it like a flower opens when it gets nourishment from the rain and sun. When you start trusting in yourself, you won’t fear being cheated on again. Q. "Do these trust triggers work to build trust when there's been an emotional affair?" A.One of the biggest reasons people have emotional affairs is because they feel seen, heard, listened to, understood and appreciated by that person. One of the most important things you can do to rebuild trust and restore your love is to use these trust triggers to reconnect your hearts. When you use our trust triggers, you fire off love signals between the two of you that make you and your spouse or partner want to connect with each other. When that happens, there’s no desire to go outside the relationship to get needs met. Q. "How easy are these trust triggers to use? What if I mess up and say or do something wrong that pushes my partner away and puts them on the defensive even more?" A.Impossible! If you’re reading this right now, we know you’ve got the only thing it takes to start rebuilding trust and your love–and that’s desire for more love and a closer and more connected relationship. These trust triggers do the heavy lifting for you so rebuilding trust and your love is easy. Q. "How soon can I expect to start feeling more trust and love between me and my partner after I start using these trust triggers?" A.Immediately. When you start using these trust triggers, they can start having a positive effect on your relationship in as little as 10 seconds. “You have saved my relationship..."
“I have really enjoyed not only the Magic Relationship Words book, but also the mini course. The series and book helped me think about how my words and attitudes could be perceived or misconstrued by my partner, and how to more effectively communicate how I’m feeling or what I’m thinking without making the situation worse. “I’m generally considered to be a kind, considerate person but this is a new relationship and I’m still learning his triggers and communication style. “Your products really helped me put myself in his shoes in a more productive way. Thanks a lot for the help! “I downloaded your ‘Magic Words’ ebook and got two audios a couple days ago. Honestly, this material is terrific. I’m 60 yrs old and have been single for 27 years. I’ve worked on myself a lot but now that I finally have a really good man, I’ve noticed my inner thinking and some outer reactions that really have nothing to do with him. Your material is really helping me clarify and take responsibility for my own ‘stuff’ so I won’t destroy what we are building. Thank you so much for what you do! You do it very well, too. “Stop the Bleeding” Communication Tools Worked!